Closed the rest of my long at 11831. I'm done with trading for today. Context will be updated at the end of the day or tomorrow morning. Context of the bigger picture will be influenced by today's daily candle. Although it looks like finally the break out attempt will be successful, but I decided to scale out half my position at 11760. My primary target zone is 11800-11840. Channel hold back the break out attempt. This my last try. SL raised to 11700. Closed long at 11718. There might be a pull back on 5 minutes chart, but I'm gonna seek a reentry though. Opened 1 contract (CFD) long. Hopefully it will bounce from the lower line of the channel. Position is closed by SL. Price action bounced back from the top of the channel. I'm gonna wait for another setup. Opened 1 contract (CFD) long. 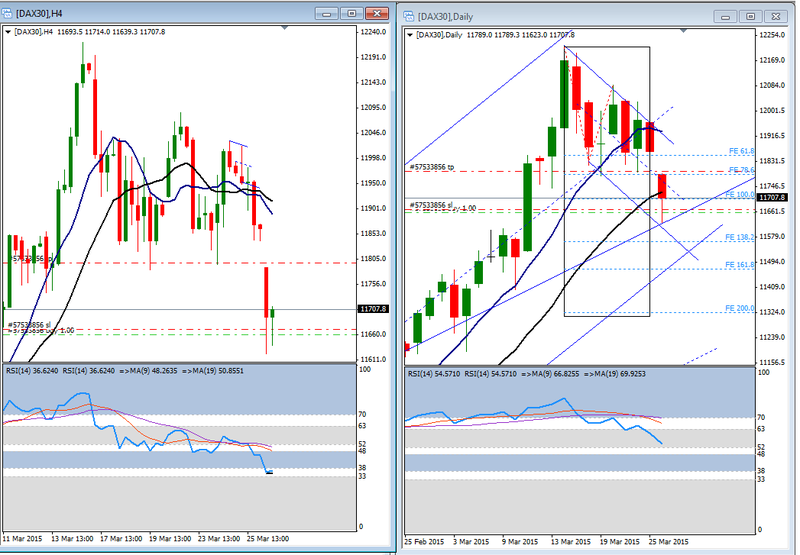 The channel drawn on 5 and 15 minutes charts is crucial. Position got stop out at 11684. I plan to reenter in case of a new local high, because I can't rule out at least one more marginal low. Just got back. On the way to a meeting I decided to try this long thing one more time and opened a long position at 1160.5 on my cell phone. I'm still not sure it will work out as I planned though. Today the daily close will be really important to me, beside the momentum of the 4 hours chart, which might find support around here. We'll see.. Even if this position will play out as I thought it will, I'm still gonna be disappointed with my performance. I should have be much more patient. Position got stop out. I'm most likely done for today with trading. I see a bigger potential in this long trade then I first thought. I lowered my SL to 11654.5. This is a little hazardous, but I can see a possibility for a gap filling today. TP at 11820. We'll see. If this position will stop out, I will be getting strike out too for the rest of the day. Raised my TP to 11749 and put on a trailing stop. I put my SL higher to 11674.5. TP set to 11730. One more shot at the long trade. Hopefully this one will pan out better then the last one. I just had a badly timed entry on the long side and my stop closed the position almost immediately. EP: 11670, SL:11655 - This was strike 2. Ending diagonal pattern got ruled out, but there is another channel that might decide the near term direction. Upside break out attempt may trigger at least a wave 4 correction on the 15 minutes chart. Position got stop out at break even but I think the context is still intact. I'm paying close attention to the possibility of an ending diagonal pattern. If the market invalids this pattern then a more intense downside movement will come. I manage my position as a counter trend trade thus hold my TP at 11610 and put on a relatively tight trailing stop. It is time to break even. Lowered my SL to 11665 and modified my TP to 11610. 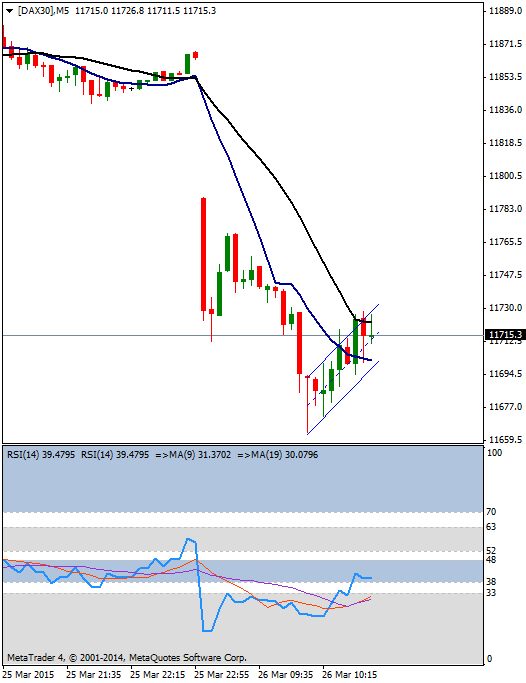 I try to play out another bearish setup with a possible bearish slingshot on 5 minutes chart. 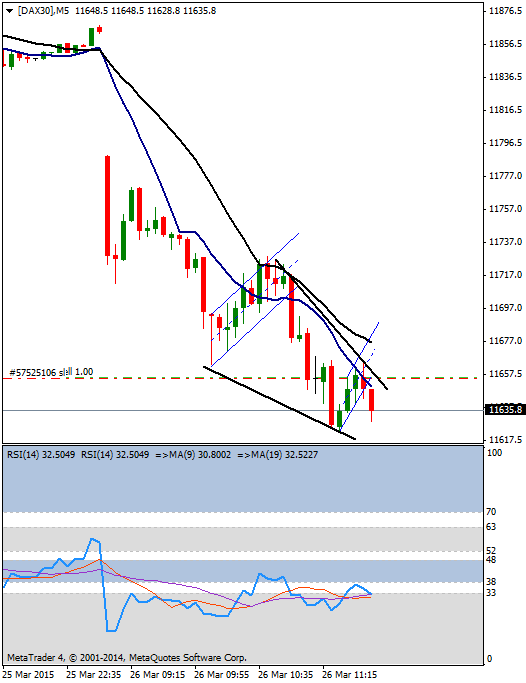 The market continued to drop lower and almost reached the target of my last trade. Even higher time frame (4 hours chart) shows signs of the bearish concept, but for a bigger drop the correction channel must be broken and ideally needs to get tested. In this case I will start to think a higher degree trend reversal. The ideal Fibonacci levels within a correction have been already reached - [w] and [y]; (a) of [y] and (c) of [y] and so on - but regarding the daily chart the ideal retracement level would be in 11500sh zone (the zone of wave 2 of an extended wave 5, which is also the zone for the 38.2 Fibonacci level). The bottom of the channel drawn on the 1 hour chart is getting near. I'm really considering closing my position. Entered on the short side on a 1 minute signal. It looks promising. We'll see how it's gonna pan out. I lowered my SL to 11710 and put my TP at 11615. I think this channel is crucial and will decide the direction of the next wave. I've sold 1 contract (CFD) but it looks like I haven't been waiting patiently enough because my position already got stop out. This is a place where patience is needed. There was a nice and pretty fast drop and so far the market left a nice gap on the chart, especially if you look at the cash index. It is difficult to enter the market this late, because very wide price swings may occur. So with my usual 15 point SL order a stop out is very likely. I need to sit on my hands and wait for a nice setup within my core risk. I pay close attention to the channel drawn up on the 5 minutes chart. 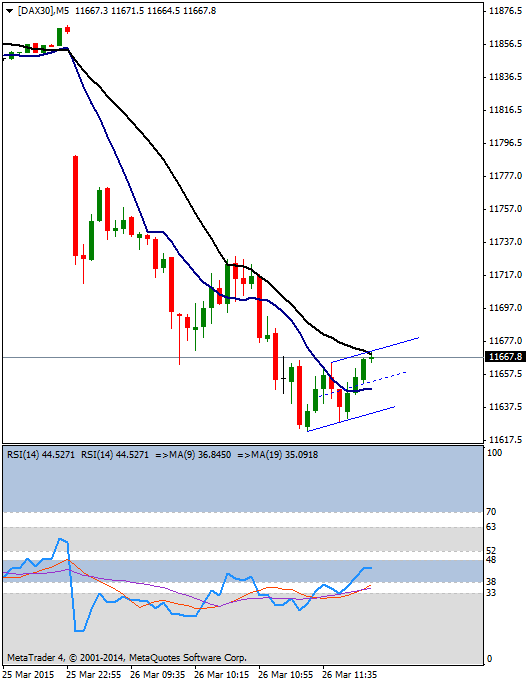 The RSI on the 1 hour chart broke the bullish support zone and the drop started from an ideal level of momentum. For more movement to the downside the traders on the 4 hours and daily charts have to think that this is actually not a "buy the dip" place. Let's take a closer look on the daily chart. As I was saying yesterday a daily close below the MA10 line might open the way for the price to touch the MA20 line. This channel created by these moving averages supported nicely the whole (in my opinion) wave 3. Today's low actually touched the base channel of the 1-2. If you box the size of wave 2 correction you can see that this drop from the ATH is already equal to wave 2 time wise. The rule of alternation would suggest if this is actually a correction then it should be a slower and more complex one then it was wave 2. It is true that you can chart the wave count differently, but this is what I followed throughout the rally and so far I see no reason to change it, unless the market prove it otherwise. With Today's gap down opening in futures, the minimum retracment for a correction was reached, but there is still more room for the bearish side.